Directions Ask us for a price! Arrival in Yerevan at Zvartnots International Airport. Transfer to hotel and overnight. 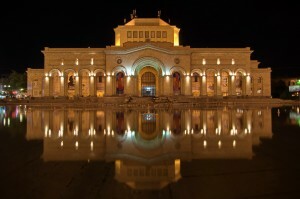 After breakfast, the tour of the city of Yerevan starts with the visit of Republic Square, surrounded by the most beautiful buildings of the city, where the Stalinist style meets the Armenian architecture, and where every evening during summer takes place the show of the dancing fountains. 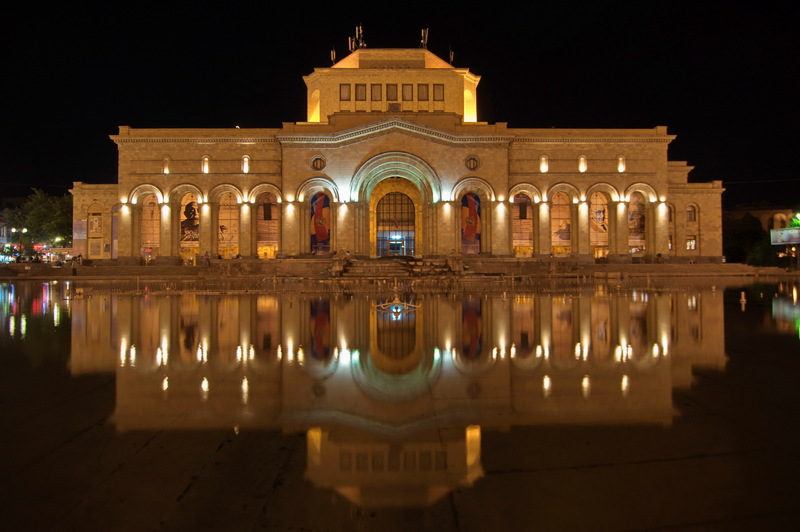 The tour continues with the Armenian Opera House and Cascade Complex, the immense staircase that connects the lower part of the city to its upper part, and that houses the Collection of Contemporary Art of Gerard Cafesjian. Continuation to Victory Park, where the large statue Mother Armenia stands on a stone base, and from where you can admire the best view of the city. Departure to Kotayk Region, where the lunch will be served at a local restaurant with the great opportunity to see the traditional preparation of Lavash, the armenian bread, a UNESCO Intangible Heritage. Visit of the temple of Garni, a roman hellenistic temple of the first century AD and the only one to survive after the Christianization of Armenia in the fourth century. Return to Yerevan and overnight. Breakfast at hotel and departure towards the Ararat Region, where, in a spectacular location just below the imposing Mount Ararat, lies the monastery of Khor Virap: here, from its terrace, you can enjoy the fantastic views of the two peaks of this magnificent extinct volcano. Inside the courtyard of the monastery there is a deep well (hence the name of the Monastery, whose name in Armenian means just "Deep Well"): inside it, St. Gregory the Illuminator was imprisoned by King Tiridates in because of his preaching of Christianity. Continuation towards the village of Areni, famous for its wines, where you will have time for a wine tasting at a local winery. Continue to Noravank monastery, situated in a narrow canyon of red rocks, which, because of its location and its architecture, is one of the most beautiful monasteries of Armenia. Departure to the ancient astronomical observatory of Qarahunj, the "Armenian Stonehenge", a series of megaliths set in a circle whose construction is dated by some scholars about 3000 years before its English counterpart. Dinner and overnight at the hotel in Goris. After breakfast departure to Halidzor to board on the "Wings of Tatev", the longest cable car in the world (5.7 km, 11 minutes ride), to reach another masterpiece of Armenian architecture: Tatev Monastery, a fortified monastery of the ninth century, once famous for its University. Continuation to Lake Sevan, along the road connecting southern Armenia to its northern part, with a stop at the Selim Pass to visit the ancient Orbelian Caravanserai, a major station along the Silk Road. Arrival at Lake Sevan, the second highest freshwater lake in the world after Lake Titicaca, and visit the cemetery of Noratus famous for its many khatchkars, the finely carved stone crosses that dot the area of the cemetery. 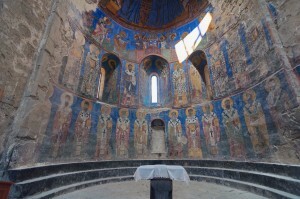 Visit the Sevan peninsula with its monastery Sevanavank. Continue to the region of Tavush to reach Dilijan, a small town known as the “Switzerland of Armenia”, dinner and overnight. 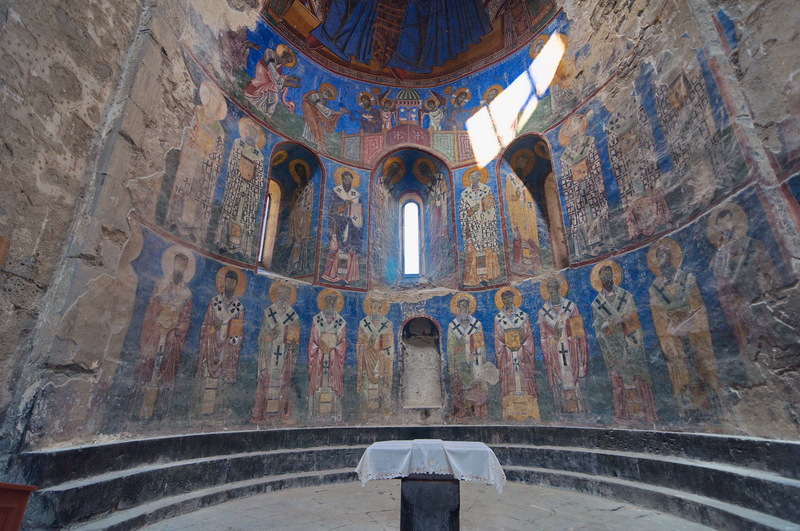 After breakfast, departure towards Lori Region to visit Akhtala, one of the few churches in Armenia with its inner walls covered with frescoes, painted between 1205 and 1216, and among the best examples of Byzantine art outside of the Empire of Byzantium. Visits go on with the monasteries protected by UNESCO of Sanahin and Haghpat (both built in the tenth century), considered the most important examples of medieval Armenian architecture. These were the places where manuscripts used to be written, copied and decorated with miniatures. Lunch in Haghpat and departure to Yerevan with a stop along the way in the village of Rya Taza at the ancient cemetery of the Yezidi minority, seminomadic Kurdish shepherds whose worship derives from Zoroastrianism. Arrival in Yerevan and overnight. After breakfast, departure towards Amberd, a 7th century fortress, located on the slopes of Mount Aragats at 2300 m above sea level. 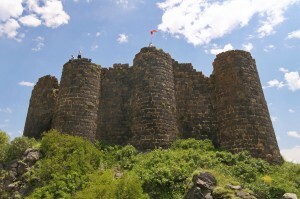 This fortress was repeatedly attacked over the centuries but only the hordes of Tamerlane’s Army managed to conquer it. 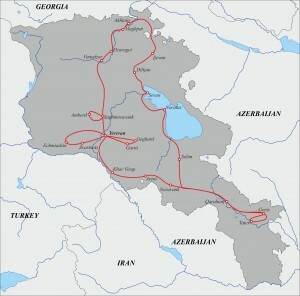 Continuation to Ashtarak Region to visit to the beautiful monastery of Hovhannavank (VII sec.) where some splendid khatchkars can be admired. Return to Yerevan and overnight. After breakfast, departure to Vagharshapat to visit the Cathedral of Echmiadzin, the oldest in the world and a UNESCO world heritage site, home of the "Catholicos" of the Armenian Apostolic Church. Continuation to the church of St. Gayane, the most venerated Saint by Armenians and one of the most beautiful examples of armenian domed church. 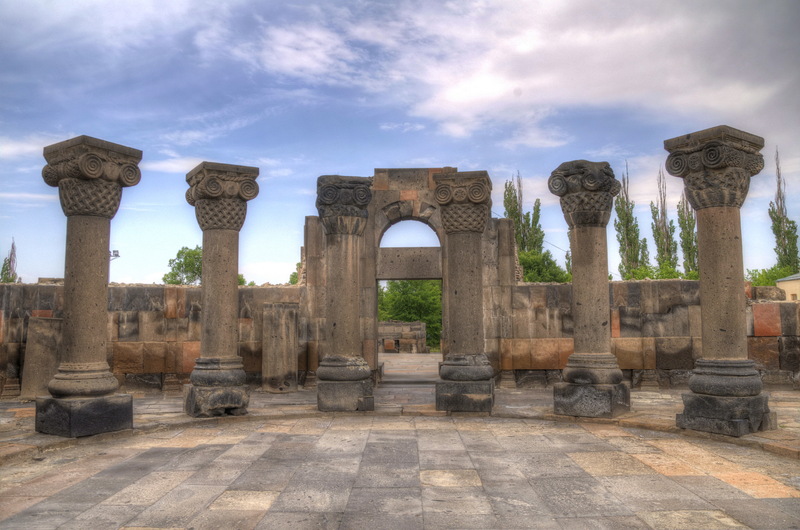 Along the return trip to Yerevan, visit of the ruins of the Cathedral of Zvartnots, built in the seventh century and destroyed in the tenth century due to an earthquake, built on an earlier urartian site and today a World Heritage Site. 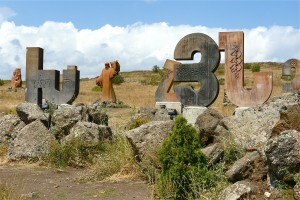 Return to Yerevan and visit of Tsitsernakaberd, the memorial to the armenian genocide. Time to visit the largest distillery of Armenia to have a degustation of one of the most famous brandy in the world: Ararat, the favorite brandy of Sir Winston Churchill. Visit of Venissage Open-air Market, the national crafts and art market (open only on saturdays and sundays). The Vernissage is the right place to get a little taste of Armenia and a special spot to witness the fusion between national traditions and modern taste. Vernissage offers various kinds of nice national souvenirs, jewelry and other traditional items. Farewell dinner in a local restaurant with traditional show of music and dances. Overnight in Yerevan.